Most American yards serve no purpose other than a status symbol. The greener our weedless grass, the more successful we imagine ourselves to be in the eyes of our neighbors. But, other than aesthetics, what good does a lawn do? It requires so many herbicides and synthetic fertilizers, you can’t even play, sit or lay on it without getting a rash or exposing yourself to cancer-causing chemicals. Not only are lawns not useful to humans, they’re not useful to countless other species of animals, who’re going extinct because they’re losing more and more habitat to lawns and corn. 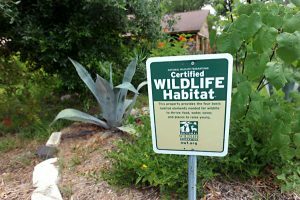 So why not transform your yard — front and back — into a wildlife habitat that provides food for you, insects and other animals who want to live in harmony with us? 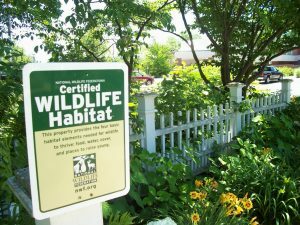 You can make a difference, the organization says, by inviting birds, bees, butterflies and other wildlife back into your yard. Whether it’s a prairie or forest garden, choose native plants that provide food for pollinator insects, birds, frogs and other small animals. Remember, what feeds the birds and the bees, also feeds us. 1. Food: Choose native plant species to restore native wildlife habitat. Focus on plants that provide nectar, seeds, nuts, fruits, berries, foliage and pollen. Feeders can supplement natural food sources. Even dead trees can provide food by attracting insects, mosses, lichens and fungi. 2. Water: All animals need water to survive and some need it for bathing or breeding as well. Build a pond, fill a small pool or even a bird bath . 3. Cover: Wildlife need shelter from bad weather and places to hide from predators or stalk prey. Shrubs, thickets, brush piles and dead trees and bird houses provide great hiding places. 4. Places to Raise Young: Some species have totally different habitat needs in their juvenile phase than they do as adults. Provide spaces for wildlife to engage in courtship behavior, mate, and then bear and raise their young, such mature trees, meadow or prairie, nesting boxes, host plants for caterpillars, dead trees, dense shrubs or a thicket, ponds and burrows. I have all the requirements except feeding the animals/birds since we have bears here it would attract them. Would I still be eligible? I would like to create a special yard for “guests”. I have a large yard that lends itself to critters. Any suggestions for apt dwellers? I’ve added feeders and water bath. City doesn’t allow rain barrels so using birdbath to transfer catch to plants. I believe I qualify. Might need to work on a few things. How do I get the info?